Economies and houses are both established on solid foundations, and the relationship between the two means that housing market numbers are part of the daily information diet for investors and traders, explained The Street Monday https://www.thestreet.com/markets/why-housing-is-a-leading-economic-indicator-14853734. The housing market represents about 15 percent to 18 percent of US GDP, said Lindsey Bell, Investment Strategist at CFRA, citing figures from the National Association of Home Builders. 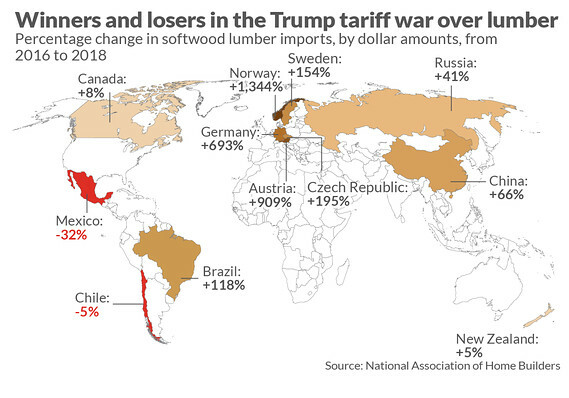 However, Canada’s share of total softwood imports into USA has slipped – to 82.6% in 2018 from 90.6% in 2016. Details are in map below, which tracks imports by changes in dollar amounts, and corresponds to a period of expansion in housing. The NAHB says that the domestic lumber market has increased, but not by much. It rose from 67 to 69 percent from 2016 to 2018. In contrast, the map, which makes Norway, Austria, and Czech Republic look like the biggest winners, but doesn’t point out those countries’ share of the total is a fraction of a percentage above zero. In early 2019, the US housing market appeared poised for continued, if somewhat tempered, strength — with a few caveats: the potential for higher interest rates, ongoing home price increases and tight housing supplies, analysts said.